"Aliens: Alien 2" redirects here. For the sequel film to Alien, see Aliens (film). For other games named Aliens, see Alien (disambiguation) § Video games. This is a chronological list of games in the Alien, Predator and Alien vs. Predator science fiction horror franchises. There have been thirty-eight officially licensed video games, one trading card game, and one tabletop miniatures game released as tie-ins to the three franchises. The first video game of the Alien franchise was released in 1982, based on the 1979 film Alien. Subsequent games were based on that film and its sequels Aliens (1986), Alien 3 (1992), and Alien: Resurrection (1997). The first video game in the Predator franchise was released in 1987, the same year as the Predator film on which it was based. Subsequent Predator games were based on that film and its sequels Predator 2 (1990) and Predators (2010). The first game to cross the two franchises was Alien vs Predator, released in September 1993 and based on an earlier comic book series. Since then the characters and storylines of the two franchises have been officially crossed over in comic books, video games, and the feature films Alien vs. Predator (2004) and Aliens vs. Predator: Requiem (2007). 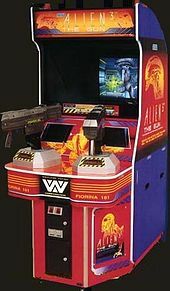 To date, there have been seventeen officially licensed video games released in the Alien franchise, six in the Predator franchise, and fourteen in the Alien vs. Predator franchise. These have been created by various developers and released for a variety of platforms including video game consoles, handheld game consoles, personal computers, and mobile phones. The Aliens vs. Predator Collectible Card Game published in 1997 and the Alien vs. Predator themed sets for HorrorClix released in 2006 are the only non-video games in the franchises. The stories of the games are set in a fictional universe in which alien races and species have dangerous conflicts with humans and with each other. The games pit human, Alien, and Predator characters against one another in various fights for survival. The settings of the games vary, with most of the stories taking place far in the future. Games have been released for the following platforms; Atari 2600, Commodore 64, ZX Spectrum, Amstrad CPC, Apple IIe, MSX, Acorn Electron, Atari ST, BBC Micro, Nintendo Entertainment System, Amiga, Arcade, PC, Sega Master System, Sega Game Gear, Sega Mega Drive/Genesis, Super Nintendo Entertainment System, Game Boy, Atari Jaguar, PlayStation, Sega Saturn, Microsoft Windows, Mac OS X, Game Boy Color, PlayStation 2, Xbox, Mobile phone, PlayStation Portable, Online, PlayStation 3, Xbox 360, iPhone, iPod Touch, iPad, Mobile device, Nintendo DS, Android, PlayStation 4, Xbox One, PlayStation Vita, iOS, Steam, VR, and Amazon Alexa. Based on the 1979 film Alien. A Pac-Man style maze video game in which the player controls a human who must collect eggs while avoiding aliens. Developed by Amsoft, Concept Software Ltd., and Argus Press Software Ltd. Published by Argus Press Software Ltd. Developed by Activision and Mr. Micro. Published in North America by Activision and in Europe by Electric Dreams Software. Based on the 1986 film Aliens. Published in Europe and North America by Electric Dreams Software and Ricochet, and in Spain by Proein Soft Line. Released only in Japan. The title appears in both English and Japanese on the packaging, with the English title as Aliens and the Japanese title translating as Alien 2. A planned port of this game for the Famicom Disk System was cancelled. The soundtrack was done by the Japanese composer, Nobuo Uematsu. Published by Activision, Superior Software, The Hit Squad, and Pack-In-Video. Based on the 1987 film Predator. The NES and MSX versions of the game differed. The NES version was also known as 'Predator- Soon the hunt will begin'. Developed and published by Konami. Developed by Oxford Mobius and Arc Developments. Based on the 1990 film Predator 2. Developed by Perfect 10, Perfect Entertainment, and Teeny Weeny Games. Developed by Probe Entertainment and Eden Entertainment Software. Published In North America, Europe, and Japan by Arena Entertainment, Acclaim Entertainment, LJN, and Virgin Interactive, and in Brazil by Tectoy. Based on the 1992 film Alien 3. Published by Activision (NA, PAL) and IGS (JP). The Japanese version is titled Aliens vs. Predator and has gameplay differences from the international version. The Japanese version is titled Alien vs. Predator. First-person light gun shooter genre. Runs on Sega System 32 arcade system board. Developed and published by Capcom. Based on the films Alien (1979), Aliens (1986), and Alien 3 (1992). First-person online shooter/action game where two teams of marines and aliens fought each other. Required GameStorm gaming service subscription. The budget for the game was $450,000 USD. Aliens versus Predator 2 is a sequel to this game. Based on the 1997 film Alien: Resurrection. Planned ports of this game for the Sega Dreamcast and PC were cancelled. Developed by Wicked Witch Software and Crawfish Interactive. Published for the PC by Fox Interactive and for the Macintosh by MacPlay. This game is a sequel to Aliens versus Predator (1999). An expansion pack entitled Aliens versus Predator 2: Primal Hunt was released in 2002. A planned port of this game for the PlayStation 2 was cancelled. Developed by Third Law Interactive. This game is an expansion pack for Aliens versus Predator 2. Developed and published by Sorrent. Published by Superscape and 3D Wireless Games. Based on the 2004 film Alien vs. Predator. Developed and published by Indiagames. Developed by Wicked Witch Software. Developed and published by Superscape. Based on the 2007 film Aliens vs. Predator: Requiem. Published by 20th Century Fox. Developed by 20th Century Fox. Developed and published by Gameloft. This game is a sequel to Superscape's 2004 Alien vs. Predator title. Developed and published by Cross Media International and Twentieth Century Fox. Developed and published by IG Fun. This game is a sequel to 2004's Predator title for mobile phones. Based on the 2010 film Predators. Developed by Angry Mob Games. Published by Game in' Action Ltd.. Developed by Game in' Action Ltd.. Developed by WayForward and Gearbox Software. This is a different game from the fanmade game demo with the same name. Set after the events of Alien 3 (1992). This is a different game from the cancelled 2002 Aliens: Colonial Marines title developed by Fox Interactive, Check Six Games, and Electronic Arts for the PlayStation 2. Aliens: Colonial Marines was initially forecast for a 2009 release, but its development was delayed in favor of Aliens vs. Predator. Versions of the game were planned for the Nintendo DS in 2009, and the Wii U in 2011. The former version was never confirmed to be in development, and the latter version was being developed, but was then further delayed and eventually confirmed as cancelled in April 2013, likely due to the notorious negativity surrounding the game at that point in time. Published by Fox Digital Entertainment. Some locations only include the first three stages of the game. Developed by The Creative Assembly. Based on the films Alien (1979) and Aliens (1986). Produced by FoxNext VR Studio and MPC VR. Distributed by 2017 Twentieth Century Fox Film Corporation. Based upon the 2017 film Alien: Covenant. This game is actually a rebranded version of Aliens: Armageddon. Developed by Fox Digital Entertainment, Inc. Published by Fox Digital Entertainment, Inc. Developed by Pure Imagination Studios. Published by Pure Imagination Studios. Developed by FoxNext, D3 Go, Theory Interactive, Rival Games. Published by FoxNext, D3 Go, Theory Interactive, Rival Games. Developed by Cold Iron Studios. Developed by Dark Vision Interactive. Published by Dark Vision Interactive. The game was based upon the cancelled animated series Operation: Aliens. This is a different game from other Alien(s) vs. Predator titles by other developers for other gaming platforms. Developed by Fox Interactive and Check Six Games. Based on the films Aliens (1986) and Alien 3 (1992). This is a different game from the 2013 Aliens: Colonial Marines developed by Gearbox Software and Sega for the PC, PlayStation 3, and Xbox 360, which superseded this game. Developed and published by Avalon Hill. Gameplay and story based on the 1979 film Alien. This game is not part of the Alien franchise. It is unrelated to the official 1982 and 1984 Alien computer games developed by Fox Video Games, Amsoft, Concept Software Ltd., and Argus Press Software Ltd. Published by Personal Software Services. Released as part of the Devastation DLC. The Predator is available as a Field Order. This game is not part of the Alien, Predator, or Alien vs. Predator franchises. Alien and Predator are available as playable characters. The Predator is available as an enemy. List of card games based on the Alien franchise. Aliens Predator Customizable Card Game 1997 Ran Ackels, Paul Brown, David Hewitt, John Myler Harper Prism, Precedence Publishing Better known as the "Premiere Edition" set * Published by Precedence Entertainment and Harper Prism. List of board games based on the Alien franchise. List of role-playing games based on the Alien franchise. ^ a b "Alien (Atari 2600) - Release Summary". GameSpot. Retrieved 2008-02-28. ^ a b c "Alien (Atari 2600)". IGN. Retrieved 2008-10-20. ^ a b c Corriea, Alexa Ray; Riendeau, Danielle (2014-10-03). "From Atari to Isolation: A video and written history of Alien games". Polygon. Retrieved 2015-07-17. ^ a b Buffa, Christopher (2014). "Alien Evolution - From Atari 2600 to PlayStation 4". Prima Games. Retrieved 2017-09-10. ^ a b "Alien (Softgold) - Release Summary". GameSpot. Retrieved 2008-02-28. ^ a b c d "Alien for Amstrad CPC - Technical Information". GameSpot. Retrieved 2008-02-28. ^ a b "Alien (ZX Spectrum)". IGN. Retrieved 2008-10-20. ^ a b "Aliens: The Computer Game (Commodore 64) - Release Summary". GameSpot. Retrieved 2008-03-02. ^ a b "Aliens: The Computer Game for Commodore 64 - Technical Information". GameSpot. Retrieved 2008-10-21. ^ a b c "Aliens:The Computer Game (US Version)". IGN. Retrieved 2008-10-21. ^ a b c "Aliens: The Computer Game (MSX) - Release Summary". GameSpot. Retrieved 2008-03-05. ^ a b c d e "Aliens: The Computer Game (ZX Spectrum)". IGN. Retrieved 2008-10-21. ^ a b "Aliens:The Computer Game (Disc Version)". IGN. Retrieved 2008-10-21. ^ "Alien 2 - Release Summary". GameSpot. Archived from the original on 2009-02-20. Retrieved 2008-10-21. ^ a b c d e "Aliens (MSX)". IGN. Retrieved 2008-10-21. ^ "Alien 2 - Technical Information". GameSpot. Archived from the original on February 20, 2009. Retrieved 2008-10-21. ^ ""Lost" Aliens Movie Nintendo Game Found". 1UP.com. Archived from the original on 2011-10-18. Retrieved 2011-01-15. ^ a b c d "Predator for NES - Technical Information". GameSpot. Retrieved 2008-10-21. ^ a b "Predator for Amstrad CPC - Technical Information". GameSpot. Retrieved 2008-10-21. ^ "Predator for Commodore 64 - Technical Information". GameSpot. Retrieved 2008-10-21. ^ "Predator (ZX Spectrum)". IGN. Retrieved 2008-10-21. ^ "Predator (Acorn Electron)". Acorn Electron World. Archived from the original on 2011-04-13. Retrieved 2011-03-27. ^ "Predator (Acorn Electron)". Games Database. Retrieved 2011-03-27. ^ "Predator for Atari ST - Technical Information". GameSpot. Retrieved 2008-10-21. ^ "Predator (Atari ST)". IGN. Retrieved 2008-10-21. ^ "Predator for BBC - Technical Information". GameSpot. Retrieved 2008-10-21. ^ "Predator for MSX - Technical Information". GameSpot. Retrieved 2008-10-21. ^ "Predator for Amiga - Technical Information". GameSpot. Retrieved 2008-10-21. ^ "Predator (Amiga)". IGN. Retrieved 2008-10-21. ^ "Predator (NES)". IGN. Retrieved 2008-10-21. ^ a b c "Aliens for Arcade Games - Technical Information". GameSpot. Retrieved 2008-10-22. ^ "Aliens". The International Arcade Museum. Retrieved 4 Oct 2013. ^ a b c d "Predator 2 for PC - Technical Information". GameSpot. Retrieved 2008-10-22. ^ a b "Predator 2 for ZX Spectrum - Technical Information". GameSpot. Retrieved 2009-04-05. ^ a b c "Predator 2 for Amiga - Technical Information". GameSpot. Retrieved 2009-04-04. ^ "Predator 2 for CPC - Technical Information". GameSpot. Retrieved 2009-04-05. ^ "Predator 2 for Atari ST - Technical Information". GameSpot. Retrieved 2009-04-05. ^ "Predator 2 for Commodore 64 - Technical Information". GameSpot. Retrieved 2009-04-05. ^ a b "Predator 2 for Sega Master System - Technical Information". GameSpot. Retrieved 2009-04-03. ^ "Predator 2 - Release Summary". GameSpot. Retrieved 2009-04-03. ^ "Predator 2 for Game Gear - Technical Information". GameSpot. Retrieved 2009-04-03. ^ a b c "Predator 2 for Sega Genesis - Technical Information". GameSpot. Retrieved 2009-04-03. ^ a b c "Alien 3 (Amiga) - Release Summary". GameSpot. Retrieved 2008-03-15. ^ a b "Alien 3 (Commodore 64) - Release Summary". GameSpot. Retrieved 2008-03-15. ^ a b "Alien 3 (Sega Master System) - Description". MobyGames. Retrieved 2008-03-15. ^ a b "Alien 3 (Game Gear) - Release Summary". GameSpot. Retrieved 2008-03-15. ^ "Alien 3 (Commodore 64) - Description". MobyGames. Retrieved 2008-03-15. ^ "Alien 3 (NES) - Release Summary". GameSpot. Retrieved 2008-03-15. ^ "Alien 3 (NES) - Description". MobyGames. Retrieved 2008-03-15. ^ "Alien 3 (Genesis) - Release Summary". GameSpot. Retrieved 2008-03-15. ^ "Alien 3 (Genesis) - Description". MobyGames. Retrieved 2008-03-15. ^ "Alien 3 (Game Gear) - Description". MobyGames. Retrieved 2008-03-15. ^ "Alien 3 - Description". MobyGames. Retrieved 2008-03-15. ^ a b "Alien 3 (Amiga) - Description". MobyGames. Retrieved 2008-03-15. ^ a b c d "Alien 3 (SNES) - Description". MobyGames. Retrieved 2009-04-05. ^ a b "Alien vs Predator - Release Summary". GameSpot. Retrieved 2009-04-05. ^ a b c "Alien vs Predator - Release Technical Information". GameSpot. Retrieved 2009-04-05. ^ a b "Alien vs Predator". MobyGames. Retrieved 2009-04-05. ^ a b c d "Alien 3 for Game Boy - Technical Information". GameSpot. Retrieved 2009-04-03. ^ a b c d "Alien 3 - Description". MobyGames. Retrieved 2009-04-03. ^ a b c d "Alien 3 for Super Nintendo Entertainment System - Release Summary". GameSpot. Retrieved 2009-04-05. ^ a b "Alien vs Predator: The Last of His Clan - Release Summary". GameSpot. Retrieved 2009-04-05. ^ a b c "Alien vs Predator: The Last of His Clan - Technical Information". GameSpot. Retrieved 2009-04-05. ^ a b c "Alien vs Predator: The Last of His Clan". MobyGames. Retrieved 2009-04-05. ^ "Alien 3: The Gun - Release Summary". GameSpot. Retrieved 2009-04-05. ^ a b "Alien 3: The Gun - Technical Information". GameSpot. Retrieved 2009-04-05. ^ "Alien vs. Predator - Release Summary". GameSpot. Retrieved 2009-04-05. ^ a b "Alien vs. Predator - Technical Information". GameSpot. Retrieved 2009-04-05. ^ "Alien vs. Predator for Jaguar - Release Summary". GameSpot. Retrieved 2009-04-05. ^ a b c "Alien vs. Predator for Jaguar - Technical Information". GameSpot. Retrieved 2009-04-05. ^ a b c "Alien vs. Predator for Jaguar". MobyGames. Retrieved 2009-04-05. ^ "Aliens: A Comic Book Adventure - Release Summary". GameSpot. Retrieved 2009-04-05. ^ a b "Aliens: A Comic Book Adventure - Technical Information". GameSpot. Retrieved 2009-04-05. ^ a b "Alien Trilogy for PlayStation - Release Summary". GameSpot. Retrieved 2009-04-05. ^ a b "Alien Trilogy for Sega Saturn - Release Summary". GameSpot. Retrieved 2009-04-05. ^ "Alien Trilogy for PC - Technical Information". GameSpot. Retrieved 2009-04-05. ^ a b "Alien Trilogy for Playstation - Technical Information". GameSpot. Retrieved 2009-04-05. ^ a b "Alien Trilogy". IGN. Retrieved 2009-04-05. ^ "Aliens Online - Release Summary". GameSpot. Retrieved 2009-04-05. ^ a b c "Aliens Online - Technical Information". GameSpot. Retrieved 2009-04-05. ^ a b Gregson, Chris (16 April 1998). "Aliens Online Review". GameSpot. CBS Interactive. Retrieved 30 May 2014. ^ Jacobs, Mark (30 May 2014). "Former Mythic boss eulogises the fallen Warhammer studio". Eurogamer. Gamer Network. Retrieved 30 May 2014. ^ "Aliens versus Predator - Release Summary". GameSpot. Retrieved 2009-04-05. ^ a b c "Aliens versus Predator - Technical Information". GameSpot. Retrieved 2009-04-05. ^ "Aliens versus Predator for Macintosh". IGN. Retrieved 2009-04-06. ^ "Alien Resurrection - Release Summary". GameSpot. Retrieved 2009-04-05. ^ a b c "Alien Resurrection - Technical Information". GameSpot. Retrieved 2009-04-05. ^ a b "Alien Resurrection (PlayStation)". IGN. Retrieved 2009-04-05. ^ "Alien Resurrection (Dreamcast)". IGN. Retrieved 2009-04-05. ^ "Aliens: Thanatos Encounter - Release Summary". GameSpot. Retrieved 2009-04-05. ^ a b c "Aliens: Thanatos Encounter - Technical Information". GameSpot. Retrieved 2009-04-05. ^ a b c "Aliens: Thanatos Encounter". IGN. Retrieved 2009-04-05. ^ a b "Aliens: Thanatos Encounter". Wicked Witch. Retrieved 2011-04-06. ^ "Aliens versus Predator 2 - Release Summary". GameSpot. Retrieved 2009-04-05. ^ a b c "Aliens versus Predator 2 - Technical Information". GameSpot. Retrieved 2009-04-05. ^ a b c "Aliens versus Predator 2 (PC)". IGN. Retrieved 2009-04-05. ^ a b "Aliens versus Predator 2 (Macintosh)". IGN. Retrieved 2009-04-05. ^ "Aliens versus Predator 2 (PlayStation 2)". IGN. Retrieved 2009-04-05. ^ "Aliens versus Predator 2: Primal Hunt - Release Summary". GameSpot. Retrieved 2009-04-05. ^ a b c "Aliens versus Predator 2: Primal Hunt - Technical Information". GameSpot. Retrieved 2009-04-05. ^ a b c "Aliens versus Predator 2: Primal Hunt". IGN. Retrieved 2009-04-05. ^ "Aliens versus Predator: Extinction for PlayStation 2 - Release Summary". GameSpot. Retrieved 2009-04-05. ^ a b c "Aliens versus Predator: Extinction for PlayStation 2 - Technical Information". GameSpot. Retrieved 2009-04-05. ^ a b c "Aliens versus Predator: Extinction for PlayStation 2". IGN. Retrieved 2009-04-05. ^ "Aliens versus Predator: Extinction for Xbox - Technical Information". GameSpot. Retrieved 2009-04-05. ^ "Aliens versus Predator: Extinction for Xbox". IGN. Retrieved 2009-04-05. ^ "Aliens: Unleashed - Release Summary". GameSpot. Retrieved 2009-04-05. ^ a b c "Aliens: Unleashed". IGN. Archived from the original on 2009-05-06. Retrieved 2009-04-05. ^ a b "Aliens: Unleashed - Technical Information". GameSpot. Retrieved 2009-04-05. ^ "Alien vs. Predator for mobile - Release Summary". GameSpot. Retrieved 2009-04-05. ^ a b c "Alien vs. Predator for mobile - Technical Information". GameSpot. Retrieved 2009-04-05. ^ "Alien vs. Predator for mobile". IGN. Archived from the original on 2010-01-06. Retrieved 2009-04-05. ^ "Predator for mobile - Release Summary". GameSpot. Retrieved 2009-04-05. ^ a b "Predator for mobile - Technical Information". GameSpot. Retrieved 2009-04-05. ^ a b "Aliens Predator for mobile". IGN. Archived from the original on 2010-09-14. Retrieved 2009-04-05. ^ "Alien vs. Predator by Elite - Release Summary". GameSpot. Retrieved 2009-04-05. ^ a b "Alien vs. Predator by Elite - Technical Information". GameSpot. Retrieved 2009-04-05. ^ a b "Alien VS Predator developer site". Wicked Witch. Retrieved 2011-04-06. ^ "Predator: Concrete Jungle for PlayStation 2 - Release Summary". GameSpot. Retrieved 2009-04-05. ^ a b c "Predator: Concrete Jungle for PlayStation 2 - Technical Information". GameSpot. Retrieved 2009-04-05. ^ a b c "Predator: Concrete Jungle for PlayStation 2". IGN. Retrieved 2009-04-05. ^ "Predator: Concrete Jungle for Xbox - Technical Information". GameSpot. Retrieved 2009-04-05. ^ "Predator: Concrete Jungle for Xbox". IGN. Retrieved 2009-04-05. ^ "Alien vs. Predator 3D - Release Summary". GameSpot. Retrieved 2009-04-05. ^ a b "Alien vs. Predator 3D - Technical Information". GameSpot. Retrieved 2009-04-05. ^ "Alien vs. Predator 3D". IGN. Archived from the original on 2008-10-16. Retrieved 2009-04-05. ^ "Aliens: Extermination - Release Summary". GameSpot. Retrieved 2009-04-05. ^ a b c "Aliens: Extermination - Technical Information". GameSpot. Retrieved 2009-04-05. ^ a b c "Aliens: Extermination". IGN. Retrieved 2009-04-05. ^ "Aliens vs. Predator: Requiem - Release Summary". GameSpot. Archived from the original on 2009-02-14. Retrieved 2009-04-05. ^ a b c "Aliens vs. Predator: Requiem - Technical Information". GameSpot. Archived from the original on 2009-02-14. Retrieved 2009-04-05. ^ a b c "Aliens vs. Predator: Requiem". IGN. Retrieved 2009-04-05. ^ "Aliens vs. Predator (working title) for Xbox 360 - Release Summary". GameSpot. Retrieved 2009-04-06. ^ "Aliens vs. Predator for PC - Technical Information". GameSpot. Retrieved 2010-02-15. ^ "Aliens vs. Predator for PC". IGN. Retrieved 2010-02-15. ^ a b c "Aliens vs. Predator for PlayStation 3 - Technical Information". GameSpot. Retrieved 2010-02-15. ^ a b c "Aliens vs. Predator for PlayStation 3". IGN. Retrieved 2010-02-15. ^ "Aliens vs. Predator for Xbox 360 - Technical Information". GameSpot. Retrieved 2010-02-15. ^ "Aliens vs. Predator for Xbox 360". IGN. Retrieved 2010-02-15. ^ "20th Century Fox - Movies In Theaters and Coming Soon - Shop for Movies on Blu-ray, DVD, 4K Ultra HD, or Digital". 20th Century Fox. Retrieved 22 March 2018. ^ a b c d e "Chillingo Partners with Fox Digital Entertainment to Bring Predators to the Apple App Store". Gamasutra. 2010-05-28. Retrieved 2010-07-10. ^ "Aliens: Infestation, Aliens: Infestation DS - GameSpot.com". GameSpot. Archived from the original on 2011-07-23. Retrieved 2011-07-22. ^ "Aliens: Infestation - Technical Information". GameSpot. Retrieved 2011-07-22. ^ "Aliens Infestation 1 Demo". Aliens vs Predator 2 Files. Retrieved 2007-03-05. ^ "Aliens: Infestation 2 Last Stand Demo". Aliens vs Predator 2 Files. Retrieved 2007-03-04. ^ "Aliens: Infestation 3 Demo". Aliens vs Predator 2 Files. Retrieved 2007-03-04. ^ "Aliens: Colonial Marines for Xbox 360 - Release Summary". GameSpot. Retrieved 2009-04-05. ^ "Aliens: Colonial Marines for PC - Technical Information". GameSpot. Retrieved 2009-04-05. ^ "Aliens: Colonial Marines for PC". IGN. Retrieved 2009-04-05. ^ "Aliens: Colonial Marines for PlayStation 3 - Technical Information". GameSpot. Retrieved 2009-04-05. ^ "Aliens: Colonial Marines for PlayStation 3". IGN. Retrieved 2009-04-05. ^ a b c "Aliens: Colonial Marines for Xbox 360 - Technical Information". GameSpot. Retrieved 2009-04-05. ^ a b c "Aliens: Colonial Marines for Xbox 360". IGN. Retrieved 2009-04-05. ^ a b Thorsten, Tor (2009-06-15). "Aliens: Colonial Marines still alive, DS edition planned". GameSpot. Retrieved 2009-08-16. ^ Fahey, Mike (2009-02-11). "Aliens Fight Predators Again in 2010". Kotaku. Retrieved 2009-04-06. ^ IGN Staff (2011-06-07). "E3 2011: Aliens Colonial Marines Shows Off Nintendo's Wii U". IGN. Retrieved 2014-08-09. ^ "Aliens: Colonial Marines Wii U Gets Cancelled". GamingUnion.net. 2013-04-06. Retrieved 2013-04-06. ^ "Alien: Isolation will be released on October 7". Warp Zoned. Retrieved 2014-07-10. ^ a b c "Alien: Isolation official, coming late 2014". GameSpot. Retrieved 2011-01-08. ^ "Pinball FX2™". www.aliensvspinball.com. Retrieved 22 March 2018. ^ "There's a new Alien game in the works". pcgamer.com. Retrieved 22 March 2018. ^ a b c d "Alien vs Predator for Lynx". IGN. Retrieved 2009-04-06. ^ a b c d "Aliens: Colonial Marines for PlayStation 2- Technical Information". GameSpot. Retrieved 2009-04-06. ^ a b c d "Aliens: Colonial Marines (2002)". IGN. Retrieved 2009-04-06. ^ a b c Thorsten, Tor. "Aliens vs Predator (2004)". IGN. Archived from the original on 2008-08-28. Retrieved 2009-04-06. ^ a b Thorsten, Tor (2009-06-26). "Obsidian, Sega confirm Aliens RPG 'no longer in development'". GameSpot. Retrieved 2009-08-16. ^ "Alien - Screenshots". Retrieved 30 July 2011. ^ "Alien for ZX81 (1982) - MobyGames". Retrieved 26 March 2015. ^ "Aliens vs. Predator". BoardGameGeek. Retrieved 22 March 2018. ^ a b Miller, John Jackson (2003), Scrye Collectible Card Game Checklist & Price Guide, Second Edition, pp. 53–56. ^ "Aliens vs. Predator: Alien Resurrection Expansion Set". BoardGameGeek. Retrieved 22 March 2018. ^ "Legendary Encounters: An Alien Deck Building Game". BoardGameGeek. Retrieved 22 March 2018. ^ "Legendary Encounters: An Alien Deck Building Game Expansion". BoardGameGeek. Retrieved 22 March 2018. ^ "Vs System 2PCG: The Alien Battles". BoardGameGeek. Retrieved 22 March 2018. ^ "Alien". BoardGameGeek. Retrieved 22 March 2018. ^ "Obcy". BoardGameGeek. Retrieved 22 March 2018. ^ "Aliens". BoardGameGeek. Retrieved 22 March 2018. ^ "Operation: Aliens". BoardGameGeek. Retrieved 22 March 2018. ^ "Alien Skirmish". BoardGameGeek. Retrieved 22 March 2018. ^ "Aliens: This Time It's War". BoardGameGeek. Retrieved 22 March 2018. ^ "Чужие против хищника". BoardGameGeek. Retrieved 22 March 2018. ^ "Alien vs Predator: The Hunt Begins". BoardGameGeek. Retrieved 22 March 2018. ^ "Alien vs Predator: Alien Warriors Expansion". BoardGameGeek. Retrieved 22 March 2018. ^ "Alien VS Predator: Unleashed". BoardGameGeek. Retrieved 22 March 2018. ^ "Battle Yahtzee: Alien vs. Predator". BoardGameGeek. Retrieved 22 March 2018. ^ "Who Will Capture the Alien Queen in CLUE®: Alien vs. Predator™?". usaopoly.com. 11 April 2016. Retrieved 22 March 2018. ^ "ALIENS Adventure Game". RPGGeek. Retrieved 22 March 2018. ^ "ALIENS: Colonial Marines Technical Manual". RPGGeek. Retrieved 22 March 2018. ^ a b c "Sundered Epochs: Aliens Versus Predator - Series - RPGGeek". rpggeek.com. Retrieved 22 March 2018. ^ "Mars Patrol". RPGGeek. Retrieved 22 March 2018. ^ "Alien Subversion". RPGGeek. Retrieved 22 March 2018. ^ "The Hunt". RPGGeek. Retrieved 22 March 2018. ^ "Aliens: Game Over". RPGGeek. Retrieved 22 March 2018. ^ "Aliens Versus Predator". RPGGeek. Retrieved 22 March 2018. ^ "Christmas on the Moon". RPGGeek. Retrieved 22 March 2018. This page was last edited on 12 March 2019, at 02:32 (UTC).